Sour dough toss off – 150g. Feed it a scant 1/2 cup all purpose or white whole wheat and 1/2 cup water. Feed the sour dough toss off and refrigerate. This should be well chilled. The most economical way to do this is probably to save two nights toss off instead of feeding the one night’s toss off. And you’ll have about the right amount. Cut the onions to the thickness you’d like the rings to be. 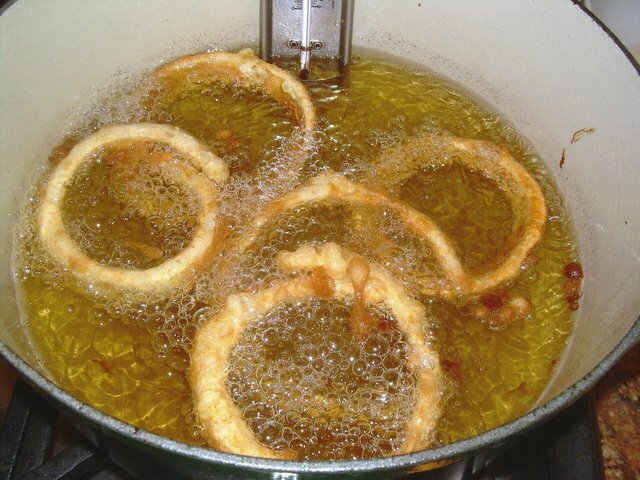 I separated the rings by twos: leaving each ring with two layers of onions and I was pleased that they were not hard to keep together in the flour, the liquid starter or the oil. Toss or drag the rings in the flour to coat. Use a heavy (cast iron works very well) 4 to 6 inch deep pan or deep fat fryer to heat at least one inch deep of oil to 375°F. Add the 1/4 cup sparkling water to the starter toss off and mix gently. Dip each floured ring into the starter mix and then into the hot oil. Not much flour stuck to the onions but it seemed fine. Do NOT over-crowd the pan – watch the temperature, and if it drops precipitously when you add the onion rings, wait until the temperature comes back up before you add more. You want to keep the oil at 375 F. Turn the rings over in the oil until they are a nice golden brown on both sides. Remove the rings as they turn golden brown with a mesh strainer or slotted spoon; takes maybe 3 minutes to turn golden. Remove to a tray lined with paper towels to drain. Sprinkle with salt to taste while they’re still hot and enjoy! Keep warm in a 220° to 250°F oven. What a neat idea! These look so good!! YUM! I haven’t attempted to make onion rings yet. They look delicious. Such a great idea for using the toss-off! They look great. 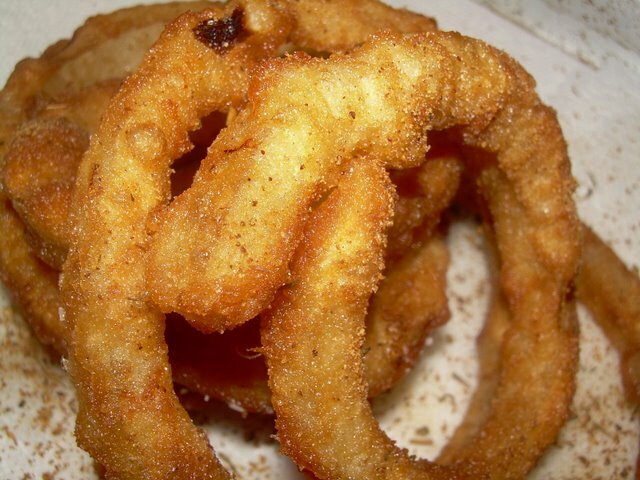 Wow, sourdough onion rings sound great! Wonderful idea! Well first off, those look amazing. 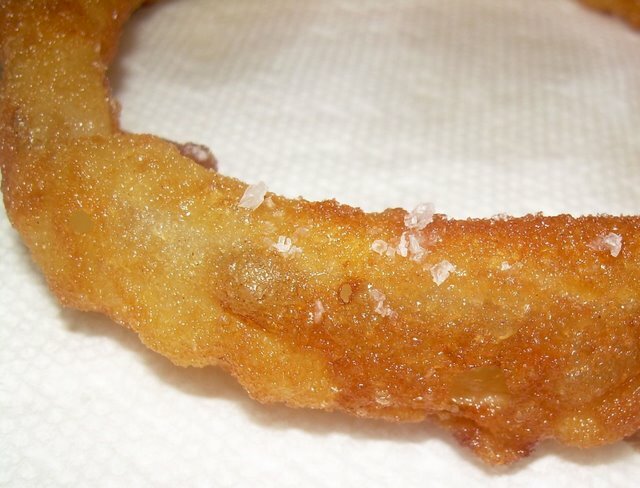 Fried onion rings are the stuff of dreams. Second, I love that you named your starter Boris. That made me smile. These look and sound so delicious that I could eat them for breakfast. Right now. Yum. Those look crazy good! Thanks Madam Chow! Onion Rings are my fave! I was wondering if you wouldn’t mind adding me to your blogroll. I would be so grateful if you would add my humble blog to your amazing blog! Thank you so much! My favourite fried food stuff! So much better than our Dutch fries with mayo! Hurray for not tossing the toss! Now your biggest worry will be how long can I put off making them again. Great picture with you standing over the pot eating them together. Delighted you enjoyed them. These look so good, and now that I am no longer afraid to deep fry, onion rings here I come! Yum! I tried making these in a skillet once and it didn’t work so great. I have a fear of deep-frying but these along with the prospect of sourdough donuts might be good enough reason to confront my fear once more! What a great and useful recipe for something that normally goes to waste! We love onion rings, and I am about to get a sourdough starter going. So, this will be something we are sure to enjoy the next time we grill! These onion rings look wickedly good. What an excellent use for extra starter! I would never have thought of it. Those look lucious! Next time I have some toss off these will be top of the list to make. Thanks for the comment about increasing the seasonings!